You bought your tempered glass online, and when it arrived, you find that your order does not fit your doorframe or does not resemble the shape you wanted. If this happens, you would possibly think of cutting the glass to fix its size or shape. How should you do it? Can you cut a glass that is already tempered? Find out here. The common method is to cut the glass to its desired size and shape before you temper it with heat. After you temper the glass, its size and shape are final, and there is no way you can cut it again without breaking it into bits. Now how can you restructure your tempered glass? You cannot. Some do-it-yourself sites may say that you can cut your glass by annealing or hardening (heating it to almost 900 degrees Fahrenheit) then gradually cooling it for approximately nine hours. This is misleading. Once you anneal your glass, you can definitely slice and cut it to your liking. 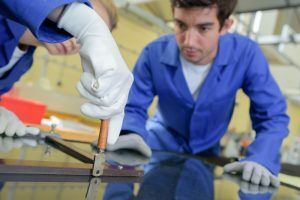 However, according to Hunker, when you anneal a tempered glass, you are basically eliminating the tough character of the glass. It is like going back to its prior condition as regular glass. You cannot count on its safety benefit anymore, and you end up having a piece of only an ordinary glass. To avoid this situation in the future, it is practical to try the commonly used glass first.